Easington Gas Terminal Pipejacking Project - Terra Solutions Ltd. When the largest supplier of gas in the UK , Centrica, needed to bring their new gas pipeline from the sea to land and into their gas storage station at Easington, they faced many civil engineering challenges and called in Terra Solutions- The Trenchless Experts- to assist. The gas storage station is located on top of a cliff face and needed to be kept open and unaffected while the pipe line was brought in by landfall. To install the new gas pipeline using trenchless methods without disturbing the existing gas storage station production, in an environment were sparks had to be suppressed. The solution to the problem was to install a shaft in the existing gas storage site down to the level of the pipeline and then tunnel by pipe jacking out to the connection point on the beach. The topography was such that the gas storage was effectively on the side of a cliff overlooking a beautiful beach. The shaft had to be sunk to a depth of around 25 meters below ground level in various strata, it was decided to use the shaft as the reception for the pipe jacked 1200mm tunnel. 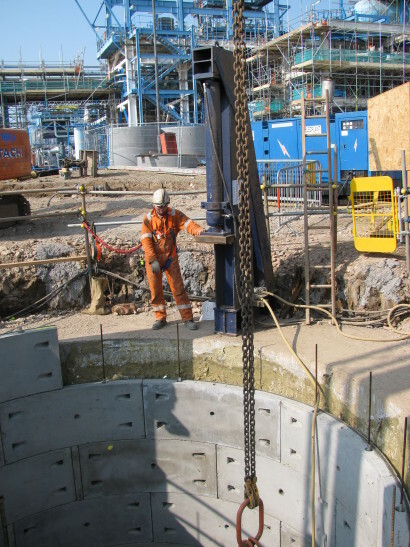 Terra Solutions installed the shaft by caisson method. Terra Solutions installed hydraulic jacks to jack the caisson shaft some 25m below the ground level in the gas storage station with a specially design collar to resist the forces exerted. The shaft was constructed using smoothbore shaft segments and had an internal diameter of 4.5 meters. The sheet piled connection shaft on the beach was used as a launch shaft for the tunnel from which Terra Solutions pipe jacked a total distance of 75m from the beach to caisson shaft in the gas storage terminal. The ground conditions were a mixture of sand and strong clay and due to the depth of the installation and the ground type the bearing pressures on the pipe jacked pipeline were massive. Terra Solutions used a specially designed lubrication system and an environmentally friendly ground lubricant to reduce the pressures on the installed tunnel. The connection was successfully installed within 2 months with no disruption to the footpath or the site works taking place for the construction of the houses and flats. The pipework was grouted up and the pipework today is flowing with precious gas. See our other Pipejacking projects here.